Holy Snap Cakes!!! Just wrapped the new Subways & Sidewalks podcast with godAwful and it is BANGIN’!!! No lie, I am really excited about this one…damn I need to do it more often. Whew!!! I was feeling like warmed over dag (if your of the piker persuasion) doo, but had some Crunk Juice (thank you sponsors!!!) started rocking the 1’s and 2’s and feel FANTASTIC now…so amped! Anyhow, the podcast will post tomorrow in my podcasts page, so be on the looks for that. ALSO tomorrow I am taking over Good Life Bar in Boston, MA for ‘Kitchen Sink’ to blow out eardrums and make heads dance till they get sweaty…check the flyer for details, if you are in the Boston area I STRONGLY recommend attending this hump day spectacular (and not just cause i am the DJ) there will be live art from Auks One upstairs, a crazy drink menu and tons of good times had by all. Click the Flyer to peep the FB invite!!! 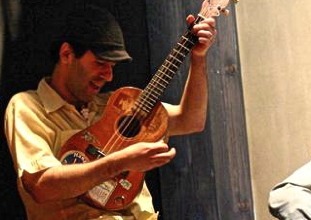 Now, onward and upward with this week’s edition of Artist of the Week, so thoughtfully provided by the good folks over at Adam’s World Blog…This week features none other thaaaaannnn, Ukulele playing rapper Jon Braman…aaawwww snap!!! A couple months ago I was at an event in the city when a friend of a friend started telling me about Jon Braman. Now, bear in mind, I hear a lot of people telling me about a lot of artists, so it takes something really interesting to get my attention. As soon as she said Braman was a rapper who played the ukulele, getting my attention was no longer an issue. After what seemed like dozens of missed opportunities to check out Braman’s work, his album, Climatastrophunk, finally arrived in my mailbox. Really interested in knowing if combining the ukulele and hip-hop could work, I put it on. It was an oddly perfect marriage, at least with Braman at the helm. His lyrics are meaningful, and at times downright beautiful, and his vibe matches those qualities perfectly. Braman describes some of the inspiration behind his music, saying “being able to sing out your fears as well as your hopes and dreams is a pretty good feeling.” This week I caught up with Jon Braman to find out more about the man, his music, and what exactly a Climatastrophunk is. Previous Post Ruff Mix Mondays!! !